You asked us, what's a freckle? 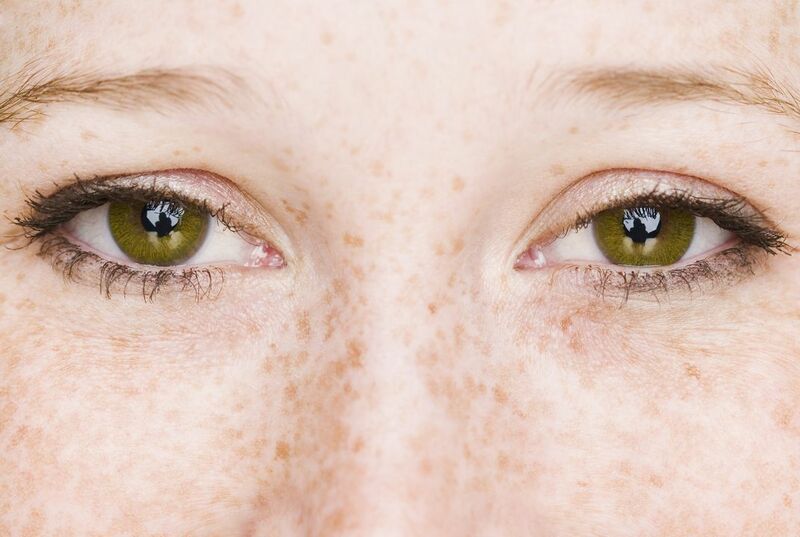 Simply put, freckles are just areas of concentrated pigment. You see, cells in our skin called melanocytes produce melanin, which is the same pigment that colors our hair and eyes, and in some people these cells tend to clump together. Now if we wanted to get our science on, we'd call freckles ephelides. (There are two types of freckles - ephelides and lentigines - this video focuses on ephelides.) I'm going to call them ephelides just because I think the name is kind of pretty. Anyway, no one is born with ephelides - they develop over time as two things come into play. The first factor is genetics. We know that at least one gene is responsible for a speckled appearance and that people with light skin and red hair are more likely to get ephelides. The second key ingredient is sunlight. Exposure to the sun cues the cells to kick into high gear and produce more melanin. The reason is that the pigment both absorbs and reflects the sun's harmful UV rays and protects our DNA from getting damaged and our skin from getting burned. The end result is that existing ephelides darken and new ones pop up, so they are a good indication of whether or not you might be getting too much sun - trust the ginger on this one. What is the connection between red hair, freckles and genetics? It's funny because I'm always in the sun but I never have had MAJOR freckles. The connection between red hair,freckles,and genetics is that the first factor is genetics. We know that at least one gene is responsible for a speckled appearance and that people with light skin and red hair are bound to get a freckle or more. My opinion on this topic is that well now I know. People with red hair tend to get more freckles because they typically have a paler complexion. Since they have paler complexion, pigment is more likely to gather in one place because "melanocytes produce melanin, which is the same pigment that colors our hair and eyes, and in some people these cells tend to clump together." Freckles can also be caused by genetics because, as well as pale skin, there is "at least one gene [that] is responsible for a speckled appearance." I was interested to learn how and why freckles form because I had many freckles when I was younger and still have a few. This article was very interesting. Before reading this I never knew that you are not born with freckles but they develop over time. Now when I see people with freckles I will know how they form. Freckles are simply concentrated pigment. People with freckles aren't born with them, they develop from either genetics, since mostly fair-skinned and ginger haired people are most likely to be seen with freckles, and exposure to sunlight. I'm not entirely sure why other people with darker or brighter toned skin colors don't get freckles as well. But, this article did inform me of how they are created which is interesting. I know from personal experience how much red hair, freckles, and genetics are related! The entire connection starts because of genetics! If you are born with the genetics for red hair, you will most likely have light, fair skin. It is almost as if the gene for red hair and fair skin are intertwined with one another. Also, the color pigment of red hair may contribute to how the freckles form because it may be a color that does not have a hard time in "clumping together" to form a freckle. If you have light and fair skin then it would make it more easy for freckles to form. People with red hair have a more pale complexion, which would result in there being freckles! This article answered a question I did not even know I was wondering about-- What is a freckle? Freckles, like other physical characteristics that set people apart from one another, are beautiful. Our natural appearance is something that makeup cannot "make better." Everyone is naturally beautiful.